The photo shows an image of filaments of material blasted into space by the tremendous stellar explosion which was the supernova that was witnessed by Chinese astronomers in 1054 AD, which generated the Crab Nebula. The new images were obtained using the Hubble Space Telescope Wide Field and Planetary Camera 2 (WFPC-2). The photo is a false color image in which light emitted by oxygen atoms in cool gas is shown as red, light emitted by oxygen atoms in hot gas is shown as green, and light emitted by sulphur atoms from warm gas is shown as blue. 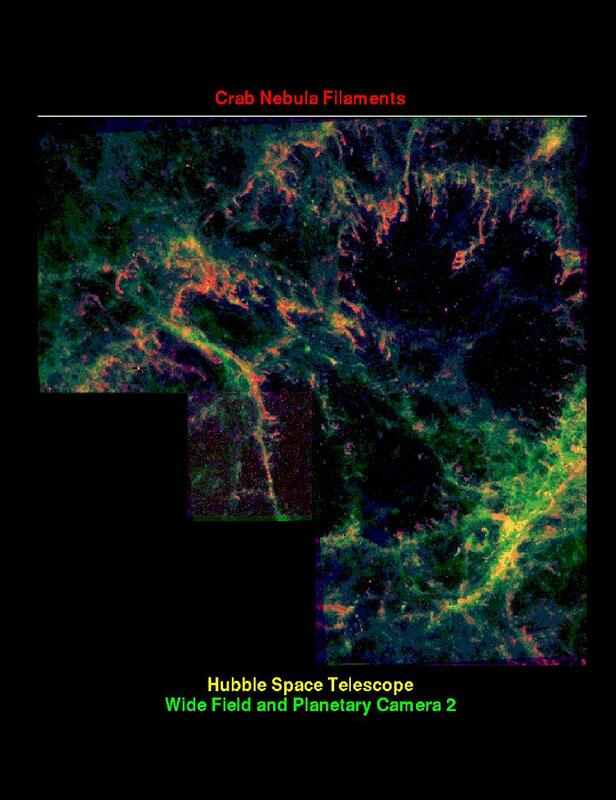 The Crab filaments are of special insterest to astronomers because they carry the chemical legacy of the star that exploded. Almost all of the elements in the universe other than hydrogen and helium were formed inside of stars, then thrown into space in events like the Crab supernova. The only reason that the earth -- and people -- can exist is because the cloud of gas from which the solar system formed had been enriched in carbon, nitrogen, oxygen, iron, and other elements by earlier generations of stars. The WFPC-2 images show that the Crab filaments are far more complex that generally assumed. According to Dr. Jeff Hester of Arizona State University and the WFPC-2 Science Team, ``This finding represents both good news and bad news for astronomers studying the Crab.'' The bad news is that much of what we think that we know about the Crab filaments may have to be revisited in light of the new data. The good news is that the new images provide such detailed information that future work on the Crab will be on much firmer footing. Perhaps the most significant discovery to come from the HST images is that the filaments bear the strong imprint of their interaction with the Crab ``synchrotron nebula.'' The synchrotron nebula is a cloud of magnetic fields and energetic particles powered by the rapidly spinning neutron star at the heart of the Crab. Just as vinegar in salad dressing ``falls through'' the lighter oil when the bottle is inverted, cold dense knots of ejecta (seen here in red) ``fall through'' the lighter synchrotron nebula that is trying to push through them, leaving streamers of hotter, more diffuse gas in their wake. The gaseous filaments were found to be much more complex, and interesting, than believed previously, by the investigation of the HST results: They are far more chaotic, with cold and hot regions, and contain much more dust than believed before. 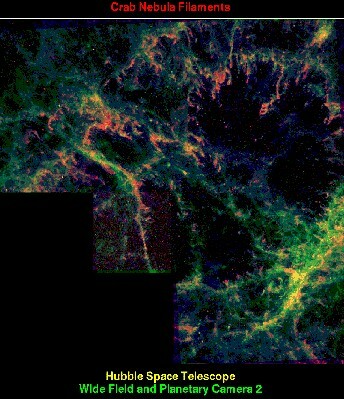 Moreover, it was found that the filaments act as a barrier which prevents the synchrtron nebula from moving outward into the interstellar space, and is in heavy interaction with this component of the nebula, as Hester explains above. For the friends of fine detail, we have extracted cuts of fine detail from this image, suitable as background for 640x480 and 1024x768 computer screens. 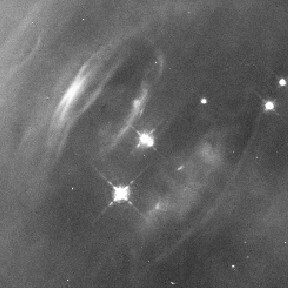 The photo shows an image of the center of the Crab Nebula obtained using the HST's Wide Field Planetary Camera 2, installed during the repair mission in December 1993. 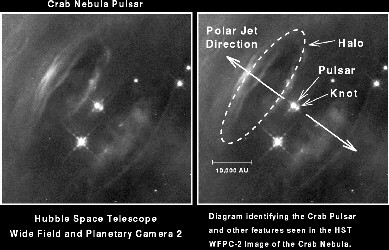 The image was taken in the light of emission from the ``synchrotron nebula'' -- a mixture of strong magnetic fields and energetic particles that is powered by the pulsar at the heart of the Crab. The pulsar -- a rapidly spinning ``neutron star'' that is so dense that a single cubic inch of its material would weigh 6 billion tons -- is left over from the explosion of a massive star seen by Chinese astronomers over 900 years ago. As the pulsar spins it also drives a ``wind'' of energetic charged particles that become the synchrotron nebula. Astronomers have long speculated on how the wind from the pulsar interacts with its environment. Based on the new WFPC-2 data, we report two discoveries that help to clarify the structure of the nebula surrounding the pulsar and provide clues about the workings of the pulsar and the nebula. The first discovery is a small knot of bright emission located only 1500 AU (= 1500 times the distance from the Earth to the Sun) from the pulsar. This knot has gone undetected up until now because even at the best ground-based resolution it is lost in the glare of the adjacent pulsar. 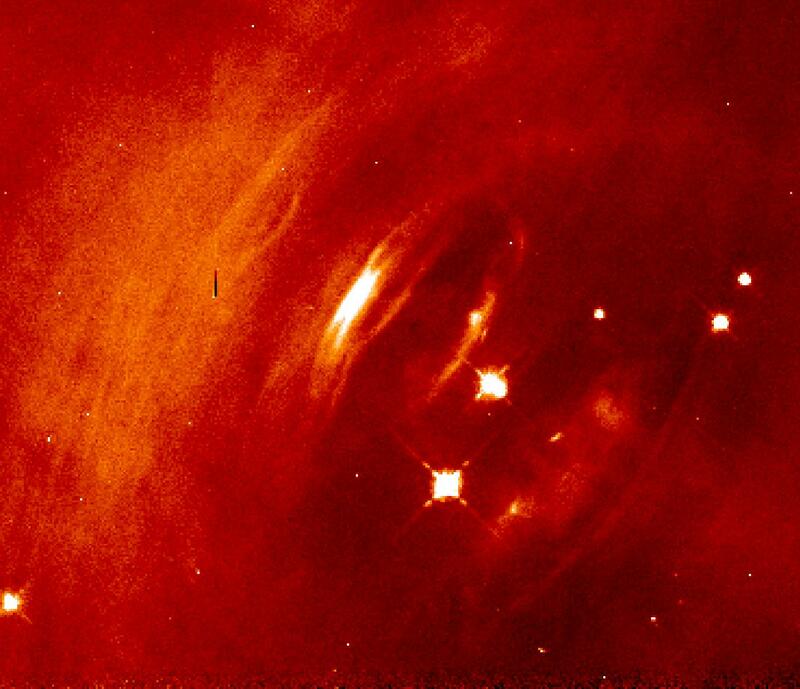 The knot and the pulsar line up with the direction of a jet of X-ray emission. We believe that the knot may be a ``shock'' in the jet -- a location where the wind streaming away from the pole of the pulsar piles up. 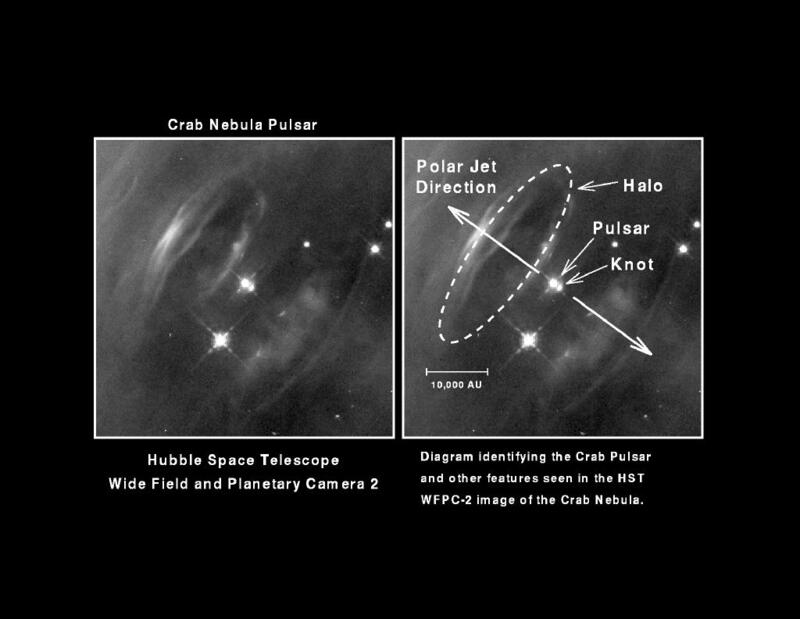 The second discovery is that in the direction opposite the knot, the Crab pulsar is capped by a ring-like ``halo'' of emission tipped at about 20 degrees to our line of sight. In this geometry the polar jet flows right through the center of the halo. The newly discovered ring may mark the boundary between the polar wind and jet, and an equatorial wind that powers a larger torus of emission surrounding the pulsar. 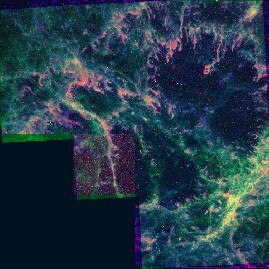 Color view (click for a BIG [185k jpg] image) of NP0532 and the central region of the Crab Nebula. The images in this page were obtained with the Hubble Space Telesope by Jeff Hester and Paul Scowen of the Arizona State University, Tempe, Arizona. Any but personal use of these images should be indicated to the authors. The results have been published (Hester et.al. 1995). Paul Scowen has also provided an earthbound Palomar image of M1, which shows the complete nebula. This is only possible for ground-based telescopes and not for the HST, as the HST's field of view is by far not large enough to take a pic of the entire nebula.